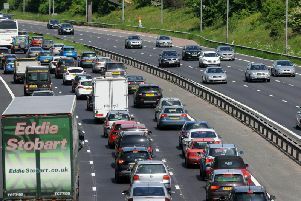 An RAC poll of 1,727 drivers found that 61% think motorway traffic has got worse over the past 12 months. The reasons given for increased congestion include major roadworks (47%) and middle-lane hogging (45%). Almost half (48%) of the drivers who believe motorway traffic has risen want tighter controls to be introduced for lorries overtaking other lorries. Motorists' perceptions of congestion are backed up by Department for Transport statistics showing that 323.7 billion miles were driven on Britain's roads in 2016, up 2.2% on the previous year. RAC chief engineer David Bizley criticised a recent announcement by Government-owned Highways England which means more than a dozen major road improvement projects in England are delayed or face cancellation. The schemes pushed back until at least 2020 include work on the M60 in Greater Manchester, the M3 in Winchester and the A5 in Nuneaton, Warwickshire. Mr Bizley said: "With unwelcome evidence of increased congestion, it is essential that the schemes to increase capacity of the strategic road network which form part of the first Road Investment Strategy are delivered to plan. "The recent news from Highways England that some projects have been delayed is therefore very unwelcome." Highways England's customer service director Mel Clarke said 18 projects already completed have added "much-needed capacity to some of our busiest roads". She went on: "Rescheduling some of our work was a sensible and responsible way to deliver major national investment in road infrastructure and will continue to ensure drivers face the least disruption to their journeys as possible. "We will continue to deliver schemes that make a positive impact on people's lives, the economy and the country as a whole." Almost three in 10 urban drivers (29%) said bus lanes are a primary cause of growing congestion, while 16% blamed cycle lanes. More than half (54%) of the motorists who say cycle lanes are the main cause of traffic problems think that cyclists should be compelled to use them when they are available. Mr Bizley called on councils to tackle congestion in towns and cities to "make an important contribution to improving air quality". He said: "The RAC urges local authorities to consider all possible measures - including better traffic light sequencing and installing speed cushions for traffic calming in preference to speed humps - to improve urban traffic flow and average speeds." Martin Tett, the Local Government Association's transport spokesman, said: "Councils are working hard to combat traffic and congestion but need to be able to do more to tackle this growing problem. "Long-term, consistent funding is needed for them to invest in local roads and introduce attractive alternatives to car journeys, such as through public transport, walking and cycling." A Department for Transport spokesman said: "This Government is investing a record £23 billion in our roads to improve journeys for motorists - the biggest investment in a generation. "We are also giving councils record amounts of capital funding - more than £7.1 billion up to 2021."